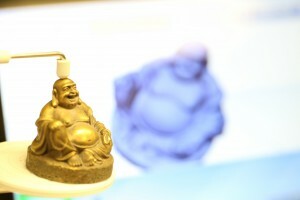 Announcing the newest edition to the Media Center: our new NextEngine 3D scanner! To complement the Makerbot 3D printer, we now have the capability to produce high definition 3D meshes of small objects within around two hours. The NextEngine software also allows us to export in the .stl format – a format that can be printed on the 3D printer – so in due time we should be able to scan an object and then immediately start turning out plastic copies. I like to think that it brings us just one step closer to having Star Trek replicators. After running a few calibration and test runs, we decided that our first victim for scanning and subsequent replication would be this miniature Buddha figurine. 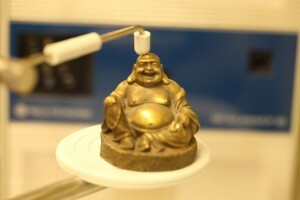 The scanner uses the combination of a camera and an array of lasers to scan objects, meaning that the easiest objects to scan aren’t too dark, light or shiny, and of course finer details and textures are harder to pick up. 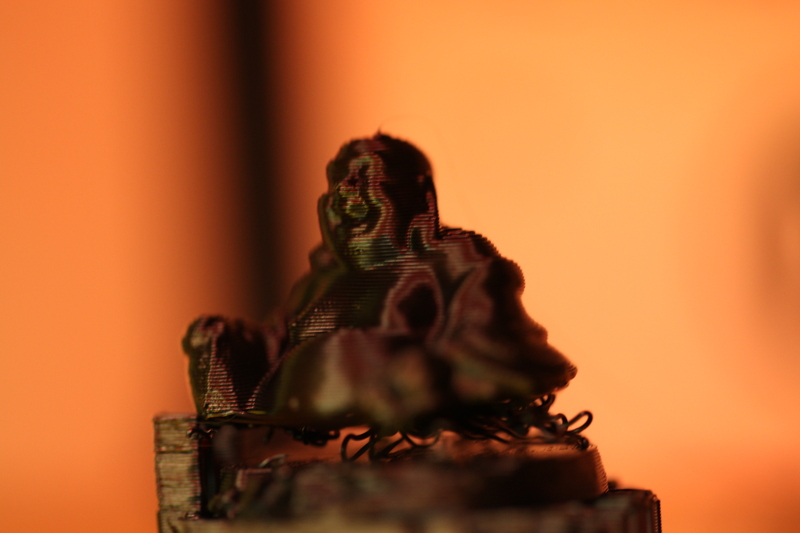 Ignoring that advice completely, we went ahead and scanned the Buddha figure. Scans take about an hour to two hours to complete depending on the detail of the scan – for the Buddha, I used two 360° scans, one at a 0° tilt and one a around a 20° positive tilt to get some of the details on top of Buddhas hands and arms. 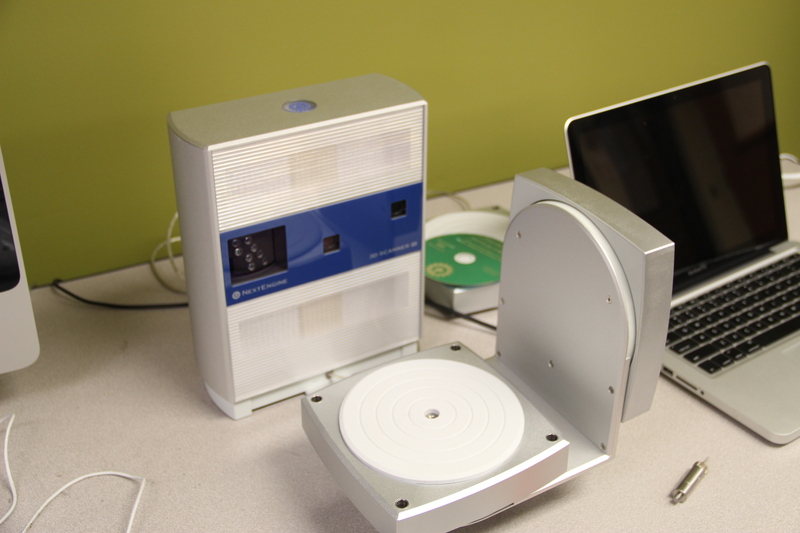 Each 360° scan family consists of six to sixteen rotations – for this one I used twelve. Once the scans are complete, the software patches them together into a single 3D model, but sometimes it needs a little manual adjustment to get it just perfect. 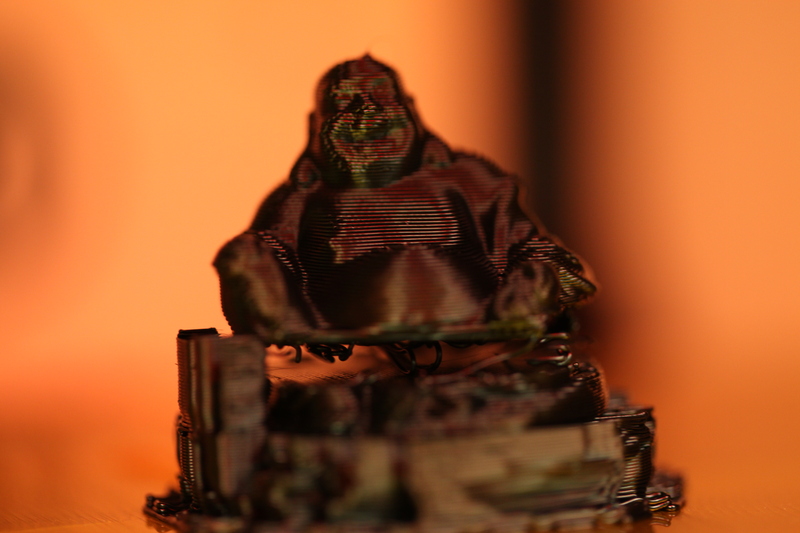 After some toying with the scans on the NextEngine software we went ahead and printed a copy of Buddha on the Makerbot! Now I would draw your attention to the surprising level of detail on Buddha 2.0’s upper body, and not the fact that his lower half is slightly completely mutilated. Then again, we learned the importance of insuring that there are no holes in the 3D mesh or Makerbot kind of freaks out. Now, we think we’ve figured out a method for getting a 3D scan that is watertight and should produce printings that aren’t bisected. 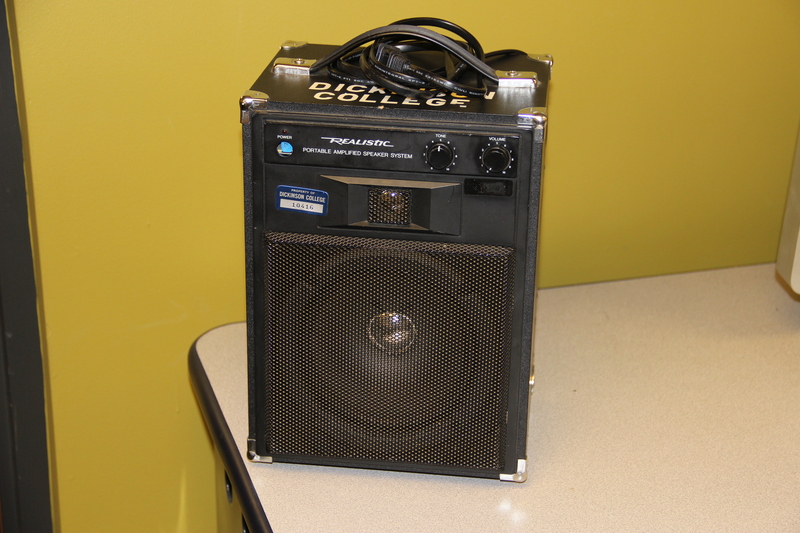 We have an audio amplifier available to be checked out. This standard amp is fairly portable and great to use with a line in or a microphone. 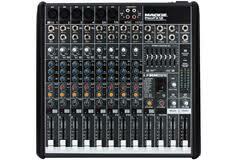 The Running Man ProFX12 is a complete audio mixer station that is still relatively portable for easy setup and fairly simple to use. 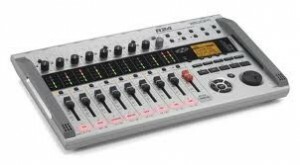 In addition to the standard audio connections, it also comes with built in USB I/O, allowing for easy recording or streaming music from a laptop. We also have the Zoom R24 available, which is smaller and more portable than the Running Man ProFX12. This model also comes complete with an SD card which can be recorded to. 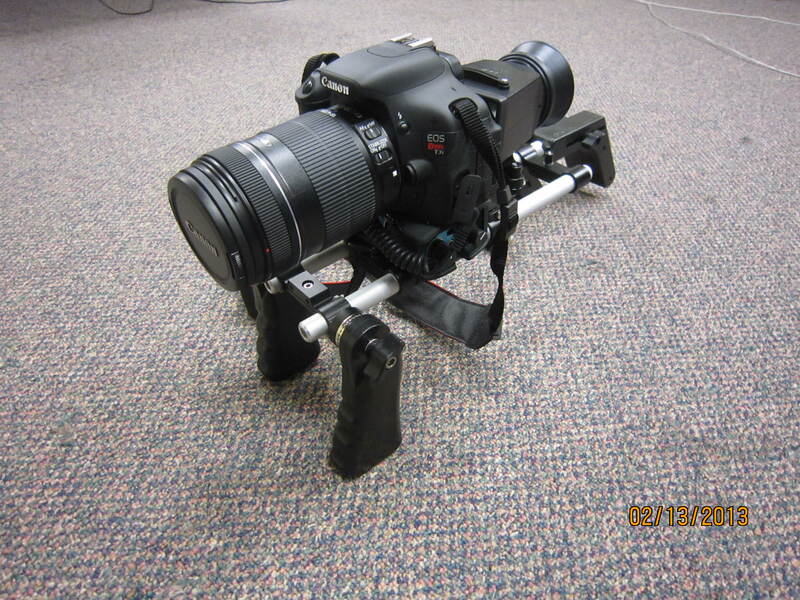 We also have a shoulder rig available which is compatible with our DSLRs, camcorders, and digital cameras. 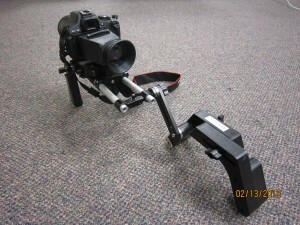 This can be an easy solution to creating stable shots with more mobility than a tripod or tripod and dolly. 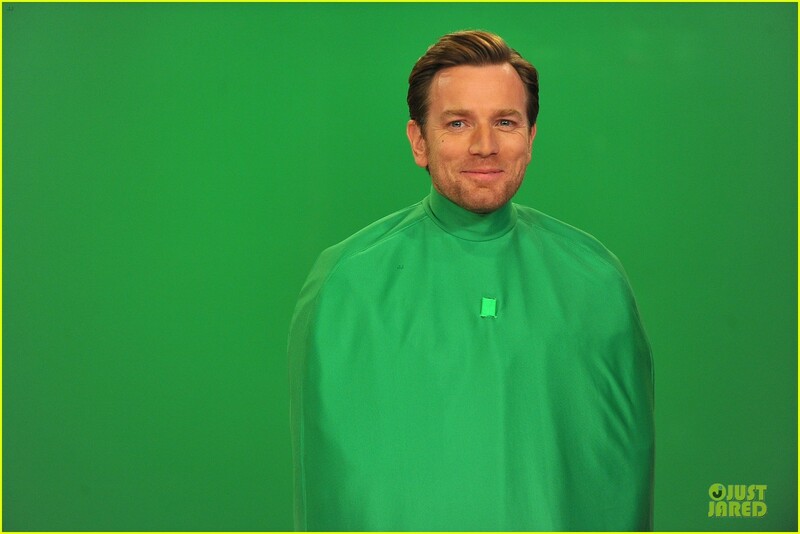 We have green screens available which can be used to provide a green background for your video or photography shots in order to facilitate digital effects. 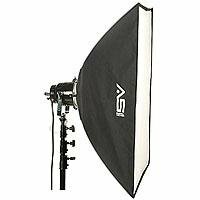 We have Soft boxes available for photography and filming which are useful when a diffused, even lighting is desired. 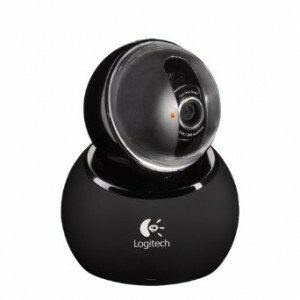 Webcams which can be connected to computers via USB are available both for checkout and installed in the various workstations at the Media Center. These cameras are easily configurable and useful for video conferencing. 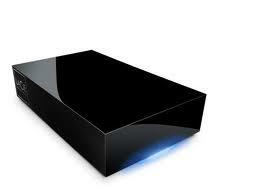 We have external hard drives available for check out. There are both terabyte and 500 gigabyte drives available. 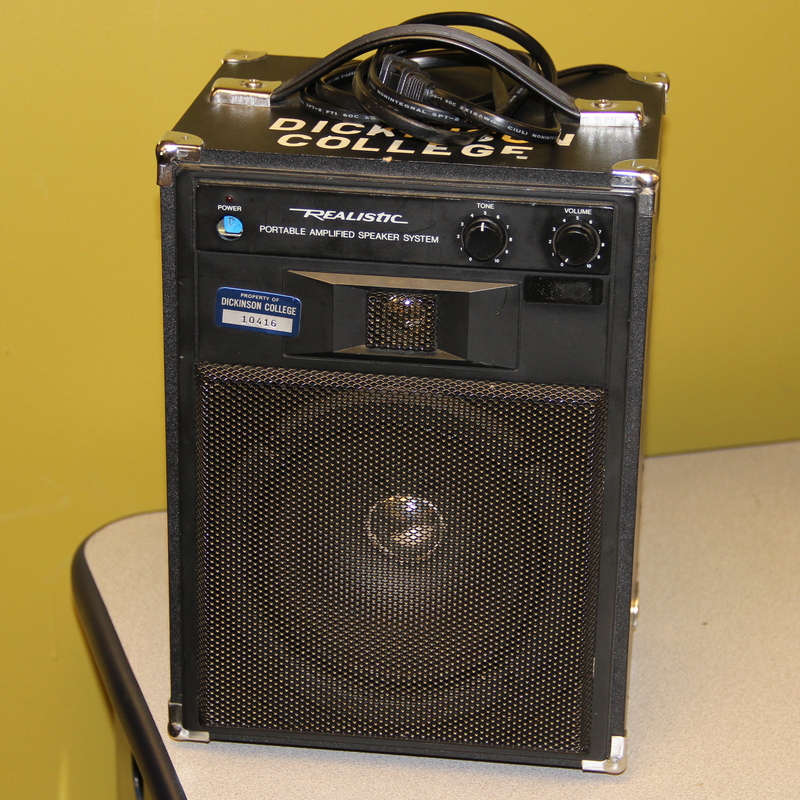 These can be useful when moving large files or large groups of files around campus. 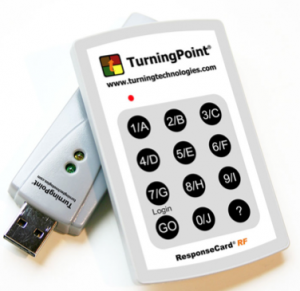 The TurningPoint response system is a wireless system used to collect responses from your audience during a class or a presentation. 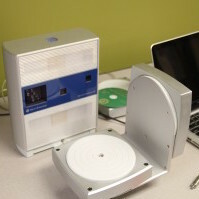 Once connected to a computer via USB, the system’s included software can be used to display a question or poll. 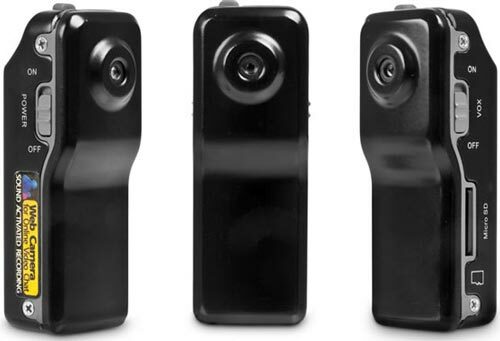 Audience members then respond on their remotes and the answers are recorded and can be displayed in real time. 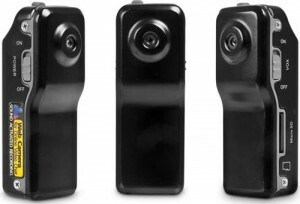 We have a total of around two hundred remotes and the system can be checked out in with any number of remotes. The Muvi Micro Camcorder is a uniquely small digital camcorder which captures high resolution video despite only being around an inch in size. 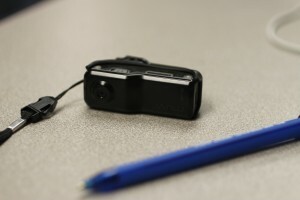 It uses a micro SD card as storage or can be connected directly to a computer. 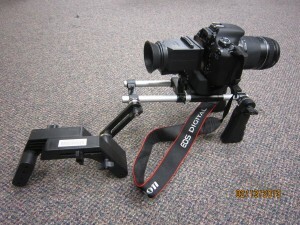 The media center’s Muvi micros come with a clip mounting that can be used to attach the camera to a variety of objects for on-the-move filming.